Steve and his Dad, Emile and our little English Pointer "Sister"
In 1997, Geraldine and Tony gave Steve, a shotgun reloader for Christmas. 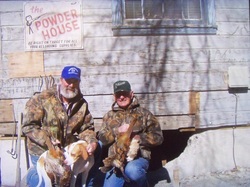 After a few weeks of Steve and Emile driving to Fallon, Fernley, Winnemucca or Reno, at least two times a week to buy reloading components of shot, powder, wads, and primers; the idea of the "POWDER HOUSE" was conceived. Emile said let's start a store for the shotgun reloaders and thus the POWDER HOUSE was born in May of 1998 after the proper licensing. At first the store was simply components, then guns and ammo began to come in. If you had rifles, you had to have scopes and the mounts and rings. Then targets had to be purchased for sighting in that gun. If there was interest in something for the shooter and it could be ordered, it was. We have enjoyed the store, the customers and all ever since 1998. Thank you Emile. You live on in our hearts.